Hollywood loves movies about Hollywood. That’s the only explanation for the baffling accolades heaped on Birdman (a two hour overtelling of what could have been a tremendous short film). But in Trumbo, Hollywood might have also found a film that is worthy of the self-adulation, coming as it does with a hefty dose of occasionally blistering home truths. Between 1947 and 1970, Dalton Trumbo was at the heart of a famously dark period in America’s politics. A rich and successful screenwriter, he might have been initially untouched by the Communist phobia and witch-hunting that began to sweep the nation, but eventually it came to Hollywood – and did its damndest to bring Trumbo and hosts of other individuals, prominent and not, in the industry to their knees. It helps that he was a considerable character – in introducing the film, star Bryan Cranston said that to play such a flamboyant figure he told director Jay Roach he would “go out on a limb, and if you hear it start to crack, please pull me back”. But actually what’s remarkable about Cranston’s performance is how restrained it is; he leaves ample room for humour and complexity, for dark moods and wry asides, for self-importance and self-consciousness. If you’re going to write about a Hollywood screenwriting legend, you need a script that sparkles and thankfully John McNamara delivers in spades, managing to tell a very serious story with a generous dollop of wry humour – even a little slapstick for good measure. While the luminous Diane Lane is sadly underused, Helen Mirren’s sequence of brief appearances as Hedda Hopper – each more dripping with devious malice than the last – are stand-outs. She made reference to her glorious array of hats, and indeed in a film with an overall stunning design there could be costume honours dished out just for her, but she commands the screen with a beautifully balanced performance, a glint of the unhinged in her eye and a seductive drawl in the delivery maintained even throughout some of her most shockingly vicious lines. Bolstering the female cast, Elle Fanning provides a sharp, sweet note of personal conscience and youthful idealism that balances the many scenes of bickering men wreathed in cigarette smoke. Meanwhile the ever-reliable John Goodman blasts through in bursts of heightened comic relief and Adewale Akinnuoye-Agbaje jeeringly reveals Trumbo’s previously unexamined prejudices in a brief but memorable performance. Trumbo naturally mythologises the man at its centre, as all watchable biopics do, but it is careful to provide balance and reality, to show flaws and misfired rage. The tropes are all there – self-aggrandisement, quirky working habits, troubled relationships – but the tone is continually, self-consciously light. The seriousness of the message is never lost precisely because it’s generally not laid on too thick; the moments of pure emotional punch deliver because they’re well-padded with sparkle. This is Hollywood at its finest – entertainment on a knife edge. Dalton Trumbo only lived to see one of his two Oscars finally listed in his name. I suspect Bryan Cranston might be polishing one of his own before too long. 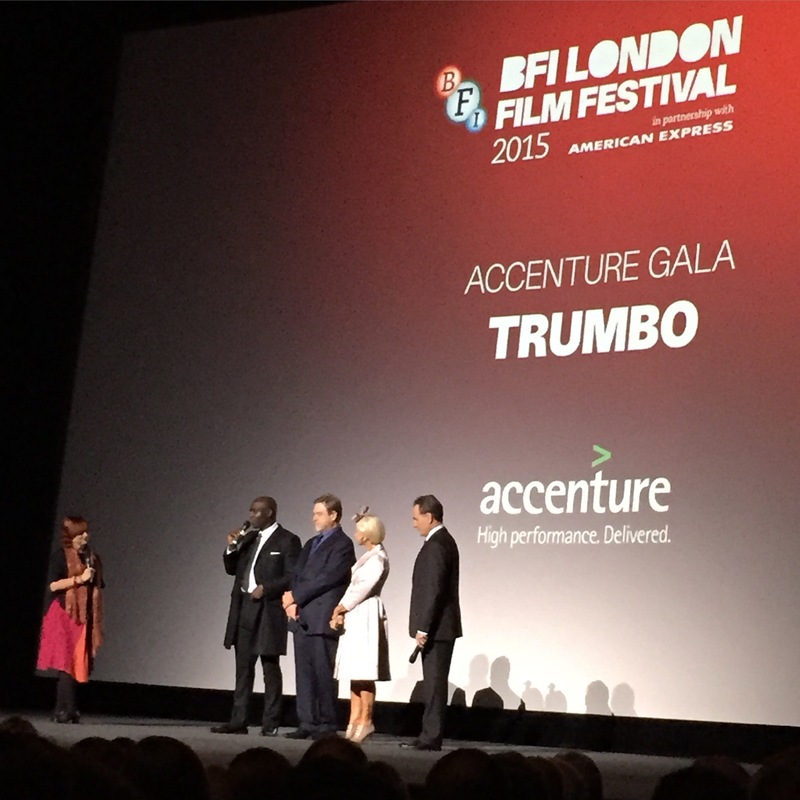 Another opening, another show… Trumbo is on general release in the UK in January 2016. No disclosure: I attended in my own capacity as a BFI Member. And because I’m an enormous nerd, I wore a true vintage 1950s shirtwaister. 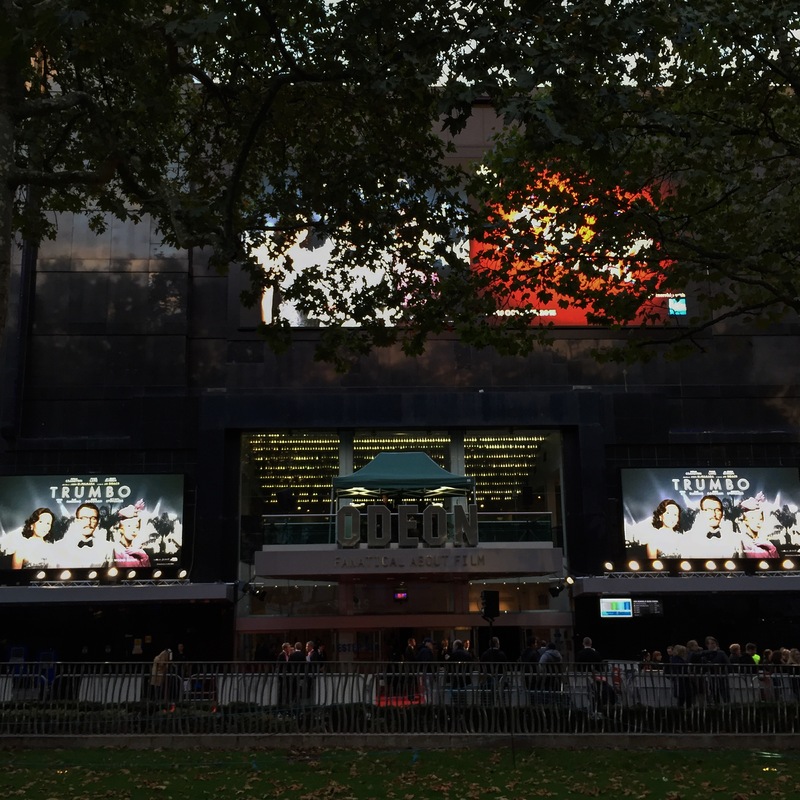 See thoughts on Suffragette here; High-Rise here.